Sure, old school bettors still enjoy the face-to-face interaction you may get at live sportsbooks. But the perks almost all major sportsbooks offer reel in new customers on a daily basis. For instance, popular online sportsbook Bovada offers new customers a $250 welcome bonus after making a first deposit on the website. Bovada also offers perks based on which sports you may be betting on. Bet365 has a similar perk for newcomers, luring new bettors with its enticing deposit bonus of up to $200. These are advantages you may be missing out on by opting to place your sports bets in a traditional sportsbook. Much like everything in the world, sports betting is transitioning online more and more each day — and for good reason. You should always enter each bet with the mindset that you will come out on top, but there are several factors to consider before embarking on an online wager. We are here to help with our detailed Learn to Earn video series, which is designed to assist bettors with everything from how to make an online wager to when is the best time to put your money down on a specific team. 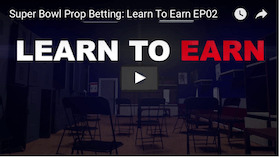 Watch episode 2 of our Learn to Earn video series to find out more about prop bets. Prop bets are quickly becoming bettors favorite type of bet so tune in and gain some valuable prop-betting knowledge. It's as fun as it is informative. And there's something for everyon when it comes to prop bets, so you don't have to be an avid sports bettor to enjoy. 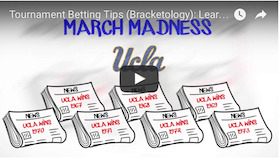 There’s more to bracket betting than just picking a team and rolling the dice. Bracketology, as it’s known, consists of hours, days and in some cases even weeks of preparation in order to strengthen your chances of coming out on top when all is said and done. In episode 3 of Learn to Earn, we delve into the art of tournament betting and show you what to look for when forming your strategy. 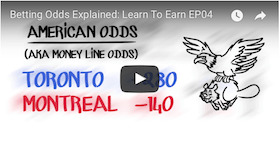 Episode 4 of Learn to Earn focuses on explaining the different types of betting odds you'll come across, from those in the UK to internationally recognized lines to US betting lines. Watch our latest video and find out exactly what the numbers in each betting line means so you can concentrate on the important stuff, making sound and eductaed wagers. This two-minute video is well worth your time in the long run. Sports betting isn’t just about picking a team and hoping for best. It requires knowledge — regardless of the sport you are placing your wager on — as well as hours of research in order to come out on the winning end of your picks. When embarking on an online bet, pick a reputable sportsbook that works best for you. There are several things to consider before making a first deposit on a leading online sportsbook. Factor in which ones are offering the best deposit bonuses or which online sportsbook is the easiest to navigate and access your account. Much like any other traditional sportsbook out there, there are several betting options when putting your money down on an online bet. One of the most popular wagers online is a moneyline bet — which is simply picking a team to win outright. Like any other bet, there is a favorite and an underdog attached to any moneyline wager. For instance, if you’re betting the Green Bay Packers at -285 to win a upcoming game, you’d have to put down $285 to win $100. On the flip side, if the Detroit Lions were +310 underdogs, you’d have to bet $100 to win $310. While it sounds simple, it does take some skill and research in order to pull off a successful moneyline bet. If you’re looking for a potential bigger return on your wager, consider a parlay bet — a format that allows you to put your money on two or more games on a ticket. Your chances of cashing in on a parlay become much tougher when betting on more than one game, but reaping the benefits of higher payouts can be exciting and will leave you wanting to get in on multiple-match wagers more often. So how do parlays work exactly? Let’s say you want to put your money on two separate teams in a $20 moneyline parlay — the New England Patriots to beat the Buffalo Bills at +285 and the Seattle Seahawks to take down the Arizona Cardinals at +220 — the payout would be $226. Take a look at our Parlez-vouz Parlay video series to gain invaluable insight about parlay bets. Other examples of betting types offered on major online sportsbooks include over/under, prop wagers as well as point spread. The latter is also a popular betting option online, especially in a parlay format. Wondering how a point spread wager works? It’s actually pretty simple to grasp. Let’s say the Golden State Warriors are at home against the Cleveland Cavaliers. The Warriors enter the match as -4.5 favorites — meaning the club will have to defeat the Cavs by five or more points to cover. If you’re gut is telling you it will be a closer match or that the Cavaliers will come out on top, you would pick Cleveland to cover at +4.5. Are feeling comfortable enough to start your online sports betting journey? Here are some of the leading online sportsbooks to consider before putting your money down. There wasn’t a more dominant performance last weekend than the Denver Broncos’ 42-17 thrashing of the Dallas Cowboys. The Broncos have had an outstanding defense for years, but their offense and third-year quarterback Trevor Siemian are the real surprise. They look unstoppable. Denver now travels to Buffalo to tackle the Bills in their first test on the road this season. It’s only a few more weeks before the 2017 NFL season kicks off on Thursday, Sept. 7. Preseason games have started. It’s time to put that game face on. Oddsmakers have made Tom Brady, who recently turned 40, and his Super Bowl champion New England Patriots the team to beat again this year. Winning a Super Bowl MVP trophy instantly puts you in elite company with all-time greats like Joe Montana, Emmitt Smith, Ray Lewis, among others. Who will join the list come Super Bowl 51? Check out who the favorites are to win it this year! The Super Bowl is oh so close and now is the time to start laying down some money on some of the hundreds of prop bet options out there. We are here to highlight the top 5 prop bets to make for Sunday's spectacular.